A little boy is standing in a big green field and he is looking for Spring. He decides to send his kite up into the air so that it can "ask around. "A seagull thinks that "Spring is traveling by sea in a boat." A swallow sees thing differently. He thinks that "Spring is resting in the sky. "A sparrow, a bird of the field and countryside, is sure that "Spring is strolling in the fields by the riverbank." Then the boy hears the words of the sun and he comes to understand that Spring is all about him in the fields of flowers, in the schools, in the factories, on every street and down every alley. Why Spring is even inside the little boy's own home. 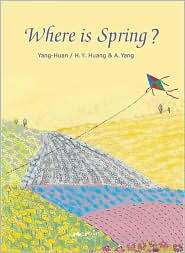 In this very special book children will discover the beauty of Yang-Huan's poetry. Yang-Huan wrote only twenty poems in his short life and this one is a true gem with its simplicity and image filled words. Gorgeous artwork captures the essence of the text; it reflects the rise and fall of the kite's passage and the journey that the little boy makes as he discovers where Spring is.